Here’s some news that will be of interest to all of the people waiting in line for gas to use in their generators. 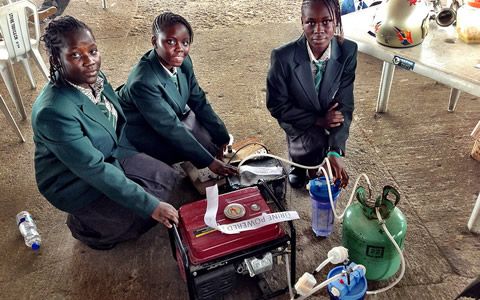 Four teenage girls figured out a way to use a liter of urine as fuel to get six hours of electricity from their generator. A big drawback is that hydrogen poses an explosion risk. But the girls used one-way valves throughout the device as a safety measure. The idea of using urine as fuel is not new. The girls have come up with a practical way to put the idea into action, though. 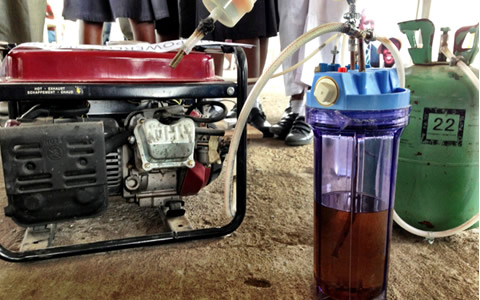 Their method for using urine to power a generator is one the average household can appreciate. Power generators are used far more often in Africa than the United States, where they are relegated more to emergency use, as in the aftermath of Hurricane Sandy. The ‘Maker Faire Africa’ blog says power outages happen multiple times a day in Lagos, so all those who can afford a backup generator have one. Still, technology needs to evolve further before such a system is feasible, at least as far as applications like powering generators go. Gerardine Botte, a professor of chemical and biomolecular engineering at Ohio University, is among those working on practical ways to make urine into a more useful hydrogen source, essentially by turning power into a byproduct of wastewater treatment. She says it takes more energy to extract hydrogen from urine than you end up getting in return as electricity. The energy equation gets even more skewed by the inefficiency of the generator used in the girls’ project. The idea behind the humble urine-powered generator is along the lines of Botte’s own thinking, and her research is all about efficient ways to break urine down into its useful components. Botte’s approach is to use electrolysis of urea as a method of wastewater treatment. She says her process for converting urine into potable water is more cost effective and more energy efficient than current wastewater treatment methods. Pure hydrogen is produced as a byproduct and can be used in generating electricity. “You cannot get net energy gain, but there is no more efficient way to get clean water from urine,” Botte says. Botte founded E3 Clean Technologies in 2011 to work on scaling the process for use by municipalities and others. The U.S. Department of Defense is trying out a portable system from E3 at military bases in remote areas, as both a way to treat wastewater and generate power. The system, which Botte calls GreenBox technology, converts a soldier’s urine into drinking water. So, when put in the context of wastewater treatment, the concept of using urine as a hydrogen source to produce energy has great potential. Since wastewater treatment plants already collect the raw material needed – urine – extracting hydrogen from it makes sense, Botte says. Doing so could regain some of the vast amounts of energy already being spent all over the world to treat waste. Consider that before you dismiss what the enterprising teens did with their own project. Maybe, as the technology evolves, it could be applied to vehicles someday. Gasoline-powered internal combustion engines can be converted relatively easily to run on hydrogen, which raises the question of whether there is potential for pee-powered cars in the future.